f) George’s Catering provides catering services for a funeral for the Smiths. The services are provided on the 8th of April and the agreed fee is $5,000. As part of the agreement, the Smiths will only make payment at the end of April. Remember: income and expenses are recorded using the accrual basis of accounting. Accrual describes amounts that have been accumulated and are still owed. Accrued income is income that is owed to us. The accrual basis of accounting means that if a sale is made in October, but cash is received in January, the income is recorded in October (not when the cash is received in January). Between October and January we record that cash is owed (a debtor is recognized). The business has made income, and this is worth $5,000. 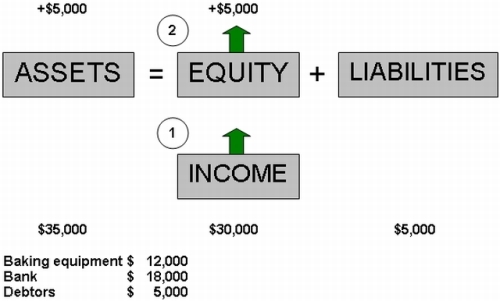 Income increases on the right (the same side as the owner’s equity). Thus, we credit the services rendered. The income is recorded straight away on the 8th of April, as the event (the provision of catering services for the funeral) has taken place. As the $5,000 is not received in cash on this date, we record a debtor (the Smiths). A debtor is an asset, as it will bring us future benefits in the form of getting paid. Assets increase on the debit side, so we debit the debtors. Okay, so that example was a little tricky. If you feel a bit confused about the debit and credit entries, check out this excellent lesson entitled Debits and Credits: what they really mean.